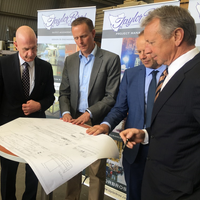 Damen Schelde Naval Shipbuilding (DSNS) has selected Taylor Bros of Tasmania to supply two high powered Antarctic landing barges for Australia’s new icebreaker, the RSV Nuyina. 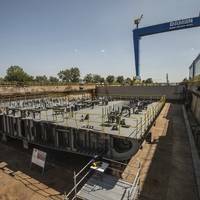 Damen is building the vessel at its yard, Damen Shipyards Galati, in Romania for the Australian Antarctic Division (AAD). 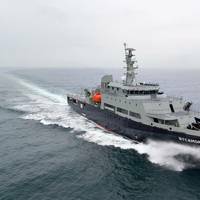 The vessel will be operated by DMS Maritime, a wholly owned subsidiary of Serco, and is an integral part of the AAD’s research program in Antarctica and the Southern Ocean. 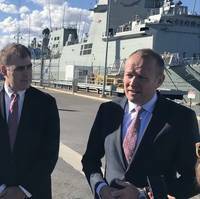 The signing ceremony was attended by the Tasmanian Minister for State Growth, Mr.
Australian Maritime Systems Group is entering into a joint venture with one of Europe’s leading marine technology companies as part of a tender for Australia’s next giant defence contract. The Brisbane-based company is partnering with Dutch firm Alewijnse Marine to support the Damen Group’s bid to build the next generation of 12 Offshore Patrol Vessels (OPVs) for the Royal Australian Navy. The vessels will be mainly constructed in Adelaide and Perth, but AMSG’s involvement would generate highly-skilled and long-term electrical engineering jobs for the Queensland-based company. 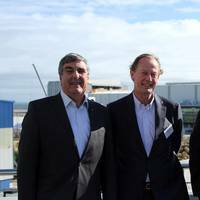 Damen Shipyards Group has sent a high level delegation to meet with key members of the Australian shipbuilding industry, signifying its commitment to the SEA 1180 Program. 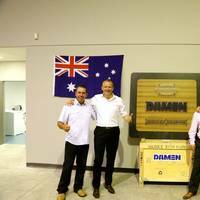 With an eye on maximizing local industry content and ensuring long-term Australian jobs, the aim of the visit was to strengthen business relationships borne out of the Damen Industry Briefings held earlier this year, the shipbuilder said. 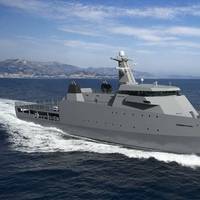 The delegation forms an integral part of Damen’s tender for the design and construction of 12 Offshore Patrol Vessels (OPV) for the Royal Australian Navy. Completing her maiden voyage, the Damen Multi-role Aviation Training Vessel (MATV) MV Sycamore arrived in Sydney harbor early on Monday morning. 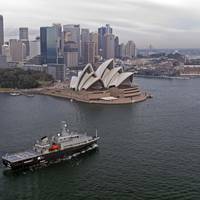 The 94-meter-long vessel is now less than a month away from deployment as a versatile multi-role vessel and helicopter training platform for the Royal Australian Navy. “It is definitely an impressive sight to see the Sycamore enter Sydney harbor,” said Damen Sales Director Asia Pacific Roland Briene. “The MATV project really highlights what can be achieved with this joint team effort. 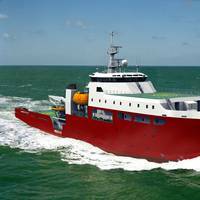 The Australian Government has signed a deal with DMS Maritime, a wholly owned subsidiary of Serco, for the delivery, operation and maintenance of an Antarctic Supply Research Vessel (ASRV) with icebreaking capabilities. 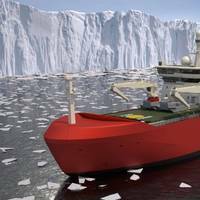 The vessel, to be built by the Damen Shipyards Group, will form an integral part of the Australian Antarctic Division (AAD) program in the coming years. The April 28 signing ceremony in Hobart Tasmania was attended by Australia’s Minister for Foreign Affairs, Julia Bishop and Minister for the Environment, Greg Hunt. Two months post-contract signing, Australia’s Bhagwan Marine received the delivery of Damen ASD 2310. The tug, named Bhagwan Pride, will begin her duties with operations at an LNG development near the Barrow Island Marine Park, off the Australian West Coast. 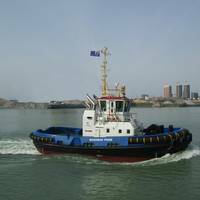 The Damen ASD 2310 is a mainstay of coastal and harbour towing and push-pull operations. The Bhagwan Pride has an ahead bollard pull of 48.7 ton and 46.5 ton astern – the total output of 3,000bkW provided by two Caterpillar 3512C TA engines. She will be mobilized for towing barges loaded with equipment. The company's Brisbane hub, aimed to serve Australia, New Zealand and the Pacific, will provide warranty services, maintenance, training and spare parts, having been recently opened by the Honorary Consul of the Kingdom of the Netherlands, Captain Kasper Kuiper. The new facility will handle all warranty or maintenance issues and offer training courses, as well having a spare parts store onsite. Roland Briene, Damen Area Director Asia Pacific, says: “We are really pleased to have established a full Service Hub in Australia from which to serve our many clients in the region.